Air purifier for home, office and indoor spaces up to 350 square feet with remote control. 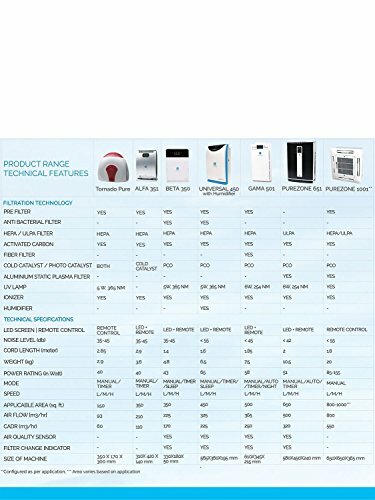 Contains pre-filter, HEPA filter, activated carbon and cold catalyst filter to remove dust, suspended particulate matter, air borne bacteria, viruses and lingering smells has negative ion generator for improved air quality. Plug and play operation with portable and compact requiring only 5 amps power supply. 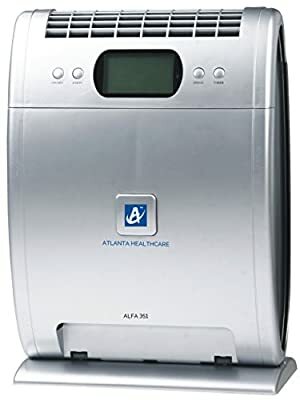 With it's advanced multi-stage air filtration technology, Alfa 351 removes dust, fine suspended particles, air-borne bacteria, viruses and lingering smells effectively. Silent operation noise level less than 45 Db. Filter size of HEPA Filter size: 240 x 230 x 25 mm; Activated Carbon and Cold Catalyst Filter Size: 240 x 230 x 25 mm. iCluster Technology is Atlanta Healthcare’s unique air puri?cation technology which focuses on eradicating various pollutants present in the environment. There are various pollutants in the air that impact human health varying from gases, particulates, bacteria, virus, smell, smoke and other harmful suspended particles. A single ?ltration technology cannot eradicate all pollutants in the air. For effective puri?cation, multi-stage ?ltration technologies need to work in tandem. 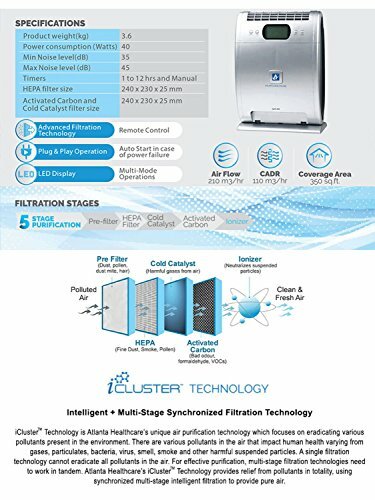 Atlanta Healthcare’s iClusterTM Technology provides relief from pollutants in totality, using synchronized multi-stage intelligent ?ltration to provide pure air.